At the Méjanes Library in Aix, I catch an unusual performance. First comes the thrum of electric guitar vibrations, then the compelling beat of drums, then the voice insistent on keeping the rhythm, the tick tock—and the intent—of the words. The voice is that of rock singer and guitarist Max, M. The words are from the third stanza of the poem “L’Horloge,” or “The Clock,” by the great and hugely influential poet– and iconic 19th century bad boy–Charles Baudelaire. 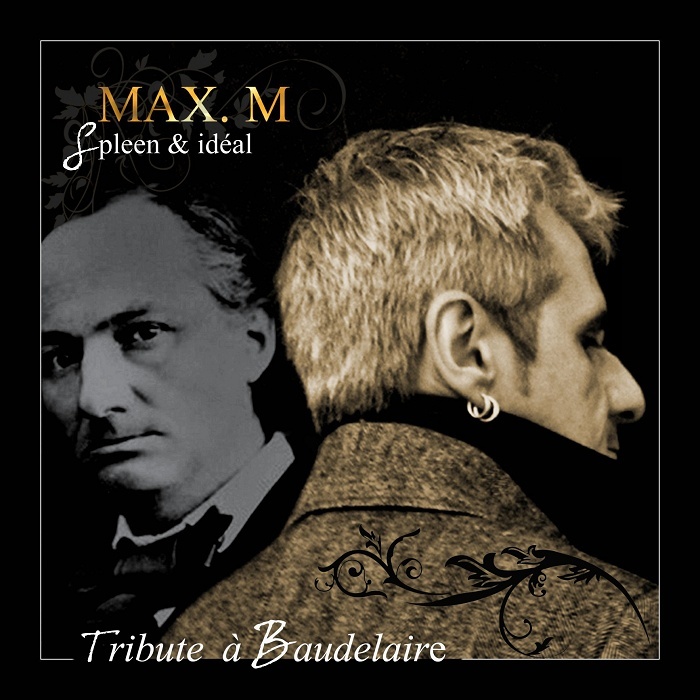 Together, words and music comprise the first song of Max, M’s CD, “Tribute à Baudelaire,” although the poem was the last in Baudelaire’s work “Spleen & idéal.” It is also part of the repertoire Max, M plays live. If “L’Horloge” is about the “sinister, terrifying god,” Time, and ends with the line “When all will say: ‘Die, old coward! It is too late!” other poems selected by Max, M reflect different baudelairean themes: sensuality, intoxication, voluptuousness, the corruption of the material world. These images are drawn from the ‘spleen’ side of “Spleen & idéal.” On the other side, are reflections on ideals of beauty, love and the symbolism found in nature. 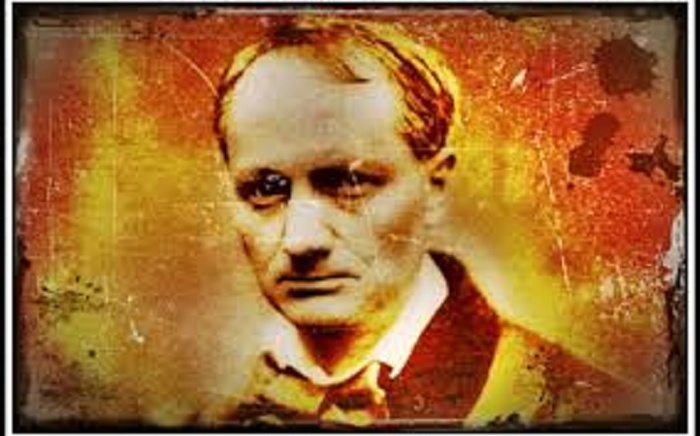 Born in Paris to a well-off family, Baudelaire developed a taste for the exotic, and the dissolute, early. As a teenager, he discovered the pleasures of alcohol and prostitutes, and quickly went through his fortune, gaining a reputation as a free-spender and a dandy. Despite the revolutionary content of much of his work, he used a formal, traditional structure–such as the sonnet—to deliver his shocking messages in forms of classical beauty. At 36, in 1857, he published the first edition of his famous “The Flowers of Evil,” of which “Spleen & ideal” makes up the first part. Max, M—short for Morena—is, on the other hand, a native of Nice, and a 21st century rock musician with a day job for the French national railways, where he is known as the “railwayman rocker.” Though he started playing music at 15 and has had a band for years, it is only recently that he connected with Baudelaire and put together his Tribute. “In 2013,” he tells me, “I went through a bit of sadness and began reading poetry and found ‘Spleen’ on the Internet.” Not only did the poems speak to his state of mind, he says, “but I had the impression of reading songs—classic French songs. 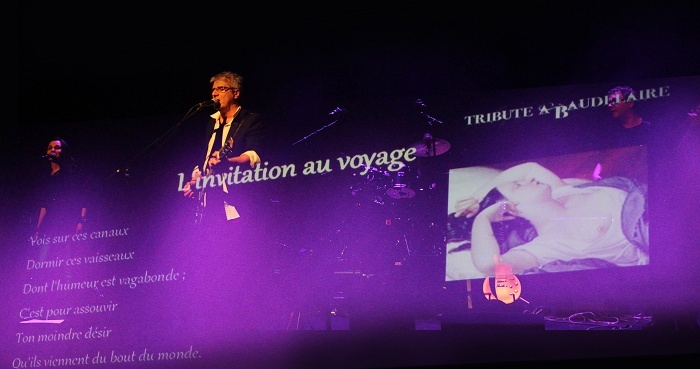 I added the music.” In that respect, he feels he is in an honored tradition of French singers—such as Jacques Brel, for example—who join music to a meaningful and poetic text. He also thinks if Baudelaire lived today, he would be a superstar songwriter. Bringing people to that sense of astonishment and appreciation underlies his sense of mission: to take his tribute far and spread the melodic gospel of the “poète maudit,” or cursed poet, as Baudelaire was known, far and wide. 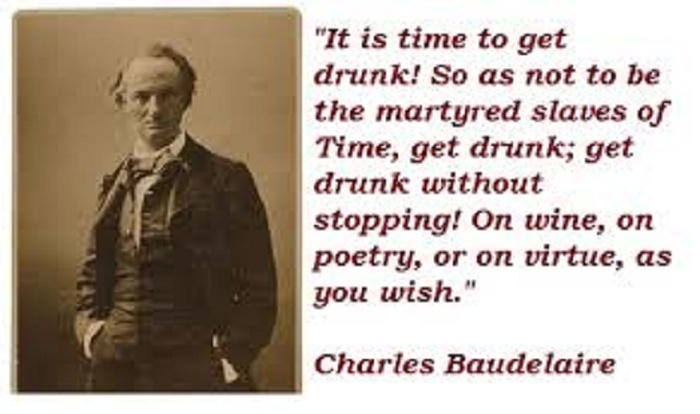 He sees Baudelaire’s work as an important part of the French “patrimoine,” a word you hear often in France, meaning heritage. He would like to take his work out of the region of Provence, where he lives and works, and spread it throughout France—to high schoolers, for example, who struggle to learn French poetry– and eventually the francophone world, such as in French-speaking Africa. Meantime, he has his railroad work and plenty of music gigs and projects. He plans to make more CDs, a video, and continue to develop Baudelaire “songs” that fit well with a rock beat. Merci, Laurie. And yes, let’s hear it for those eternal, irresistible bad boys.